e have stressed repeatedly that the February 10 local council election results were largely a shattering protest vote against the National Government for what most of the people see as its failure or slowness to fulfil most of its pledges as well as its inability to deliver all-important development or reduce the cost of living. But it is also important that the country’s stability be maintained so that the vital, large-scale foreign investments will come in and the sustainable economic development plan with its eco-friendly and all-inclusive strategy could be effectively implemented. In this context the United National Party (UNP) -- which has a majority of seats in Parliament -- yesterday announced that the party had decided to continue with the yahapalanaya government but also introduce important reforms. The UNP’s General Secretary and Senior Minister Kabir Hashim told a news conference that following a meeting with Prime Minister Ranil Wickremesinghe, the UNP parliamentary group had decided to continue with the unity government and carry out party reforms. 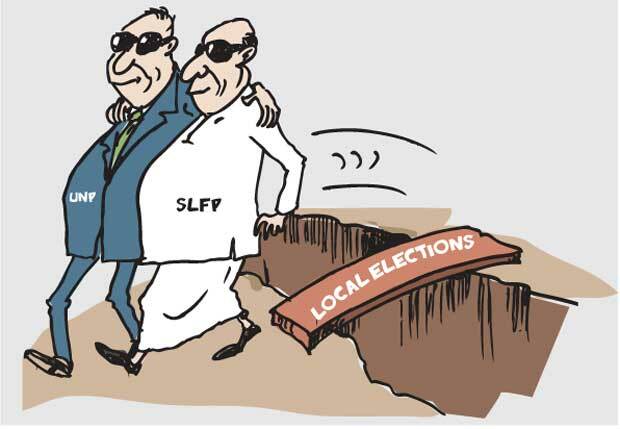 This was the second meeting in two days between UNP MPs and the Prime Minister in the aftermath of the local council elections where former President Mahinda Rajapaksa’s new Sri Lanka Podu Jana Peramuna (SLPP) recorded a sensational victory in almost 70 per cent of the councils. The UNP General Secretary claimed that all the party MPs had agreed with the decision to continue the unity government with the Sri Lanka Freedom Party (SLFP) and the United People’s Freedom Alliance led by President Maithripala Sirisena. Yesterday’s UNP parliamentary group decision was in marked contrast to widespread views expressed by leading party members earlier this week that the UNP should go it alone and form its own government without the SLFP. Responding to reporters’ questions, Mr. Hashim said the unity government -- which the UNP and the SLFP formed after the parliamentary election in August 2015 -- would continue as it was and its two-thirds majority in parliament had not changed. He said if any other party wanted to take over the government then it had to show a majority. “We will strengthen the government while listening to the message delivered by the people and carry out a new process. That is what we decided. We will make sweeping reforms in the party. Government policies and the party’s structure will be changed so that more benefits will go to the people and the battle against corruption intensified while urgent and effective steps will be taken to bring about poverty alleviation and step up the battle against global warming,” he said. Meanwhile, Joint Cabinet Spokesman and Senior Minister Rajitha Senaratne -- known to be playing a major role in maintaining the unity government -- told reporters yesterday, a cabinet re-shuffle was likely soon. Addressing the weekly Cabinet news conference, Dr. Senaratne also said the good governance administration would continue for the next two and half years. Law and Order Minister Sagala Ratnayake said on his official Facebook yesterday, he was ready to resign from his ministerial portfolio for the benefit of the UNP. Senior UNP and SLFP ministers have said President Sirisena, officially silent up to now, is likely to make a media statement today amid conflicting and confusing reports about where Sri Lanka will go from here. Whatever decision or political division, priority needs to be given to the welfare and the well-being of the people.